When Jay Carlson has a run in with a strange, dark truck on a lonely road, his life goes south. He sees things that others don’t see. He learns things he wishes he could forget, and he is drawn into an ancient battle he wouldn’t have believed in even a day in the past. This time, even country music and the open road can’t save him. Join authors Colleen Drippe’ and Karina Fabian as they take you to the darkest places on the road. Also includes two extra stories and an excerpt from the novel Neeta Lyffe, Zombie Exterminator by Karina Fabian, available now from DAMNATION BOOKS. 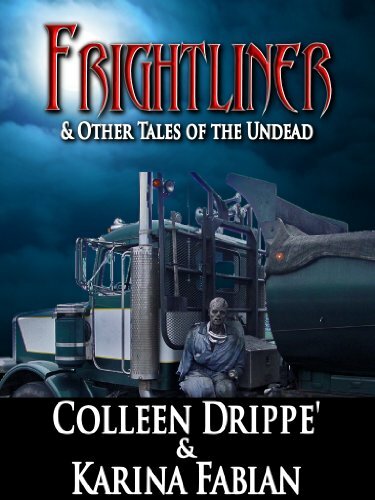 I have been reading Karina Fabian for a while now, and with the publication of “Frightliner,” I’ll now be reading Colleen Drippe’. The title story and lead are a very smooth blend of the two authors’ writing. There are touches reminiscent of some of Stephen King’s better efforts without actual aping his style.